SMME GROWTH: SMME’s attended SANRAL Southern Region’s Women in Roads Seminar held at Lily Lodge in Port St Johns. August 29, 2016: The percentage of women-owned SMMEs on SANRAL’s community development type projects has gradually grown from 30% to 40% over the past three financial years. It was announced at the roads agency’s Women in Roads Seminar – its principal Women’s Month event. The seminar focussed on women SMMEs and informed them about SANRAL’s business opportunities and how the roads agency will continue to assist and empower them. “The development of SMMEs forms part of SANRAL’s broader socio-economic development initiatives. The agency look for ways to empower emerging entrepreneurs to enable them to enjoy the long term economic benefits from SANRAL projects,” said Marlize Nel-Verwey, SANRAL Southern Region project manager. SANRAL has a consistent and long term programme to support women in road infrastructure development and is making significant strides in mainstreaming women-owned road construction business. SANRAL also awarded 45 contracts worth about R903 million to professional consulting engineering companies to design and supervise road and bridge works, of which about 40 percent was earned by black-owned companies. Mandisa Giyose, MMC (Research, IGR and IDP Planning) for O.R. Tambo District Municipality, said the municipality supports SANRAL’s role in women empowerment. 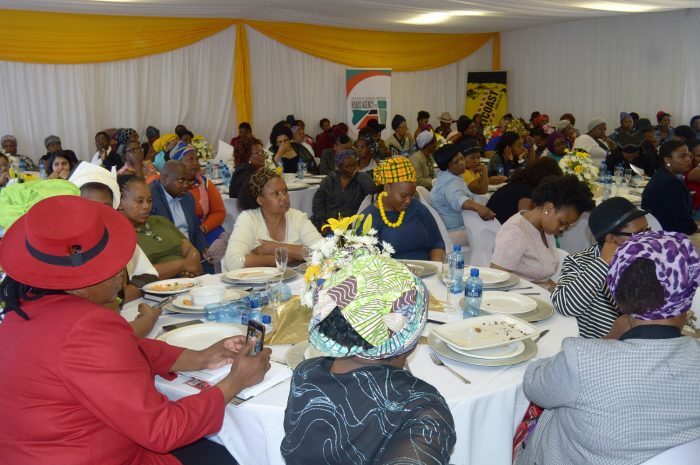 She also expressed the municipality’s role to uplift lift women-owned SMMEs in the region. “We commit as the district municipality to ensure that when mega projects like the Mzimvubu Dam and N2 projects commence, women SMME’s will be the majority beneficiaries. We want to ensure that up to 60% of upcoming projects be awarded to local companies,” Giyose said. Nel-Verwey said that although big strides are being made towards gender equality, statistical data indicates that the number of women engineers and students are declining world-wide. According to the Construction Industry Development Board (CIDB), there are currently a total of 35 049 civil engineering construction companies registered on their data base, of which 11 397 are women-owned. “Sustainability is central to all of SANRAL’s activities – the roads agency strives to create opportunities that enable communities to become economically independent by actively involving them in infrastructure construction and also providing them with a stake in projects,” she said. SANRAL has been involved in community-based construction projects that create jobs and develop skills in South Africa. Several women-owned engineering companies have been appointed to work on SANRAL’s conventional and routine road maintenance projects. Most of SANRAL’s community development type projects are scheduled over a 24-month period. This allows SANRAL to present a South African Qualifications Authority (SAQA) accredited qualification to SMMEs on these projects – this qualification empowers business owners to secure future business opportunities. “With the SAQA qualification the SMMEs can apply for work at municipalities or other companies,” Nel-Verwey said. In the 2014/15 financial year, SANRAL nationally had spent R2.9 billion on contracts with small businesses and 4 064 people were trained in aspects of road building, of whom 694 were women. In the 2014/15 and 2015/16 mid-year results, a total of 324 women owned enterprises were contracted by SANRAL to the value of just more than R1.2 billion.